Quick site update on a few items! FLESH-COLORED HORROR GAG MANGA CONTEST! We've received a couple entries so far, and it sounds like a few more people are working on their strips. Since today's my birthday and I'm feeling generous, we're gonna extend the deadline for the contest to 11:59 PM on Sunday night (6/17/07, PST, you know the drill). Again, the prize for the best original 4-panel gag strip is an awesome original copy of Junji Ito's Flesh-Colored Horror collection. 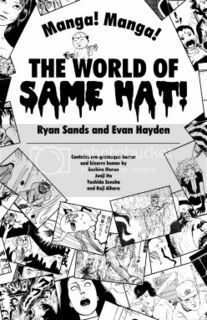 In clearing-my-plate-of-stuff-hanging-over-my-head news, I finally got our second batch of The World of Same Hat booklets back from the printer, and am ready to mail them out. To be clear, I only printed up 25 copies to send to folks that previously had expressed interest, and these are totally free for you dudes. hey, I'd love to get a copy if there happen to be any extras :) thanks! If there are extras, I'd like a copy too! i'd love a copy if there are any extras. I would also like a copy, if there's any extras. Thank you. I'd like a copy too, if you have extras. Thanks! if it's not too late... i'd like to get a copy too. thanks! @vivian: Sorry I didn't have you on the list-- I missed your previous comment and should have added you to the short list. Yours is in the mail already! @everybody: I'm working on getting copies out and will let everyone know about extras! thanks for the interest, and I will talk post again soon. woo, i'd really like one too, if there are extras to go round! I'd love an extra booklet, and would be happy to pay for it. Please. Anyone can scan it and post on rapidshare or similar? I´m from Spain and love this blog! UPDATE: I'm still mailing out copies back from the first time we took names (around APE), but we won't be offering any for sale. The booklet isn't anything that needs to get RAR'd, since it's literally just a collection of all the scanlation stuff we've posted for free on the blog already (albeit, with snazzy layout and staples, etc). I've spent about ~$200 bucks on the 45ish total copies we've printed, given away and mailed out, so I don't plan to keep making more after this batch runs out. That said, I will definitely see if I have extra copies left over and try to get them to the people who've expressed interest up until now. Thanks for understanding! Will update once on these at the end of the week! I received mine two days ago and it was AMAZING :) I passed it on to Matt to read at work today.